This Diestel Organic Dark Ground Turkey comes in a 454 grams pack. Diestel Family Tukey Ranch has been perfecting raising delicious, all-natural turkeys, preserving four-generations of family ranching tradition in Sonora, California. Following specific farming practices, their turkeys are free-roaming, only having vegetarian diets that exceed food safety standards, to continue producing clean artisan food everyone will feel good serving. Birds are given ample time to grow and develop naturally. Diestel Family Turkey Ranch alsogoes above and beyond for the environment. Theypreserve rare breed, andembrace regenerative practices that help conserve natural resources. Expect nothing but premium turkeys with full of juicy flavors are produced, uplifting the family’s legacy for over 100 years to date. 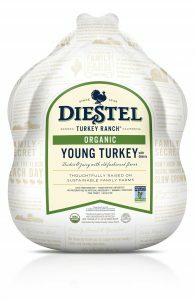 Diestel make their ground turkey from organic whole muscle dark turkey that is boneless and skinless. Their ground turkey contains approximately 5% fat. Pure ground turkey, No Fillers!